The Montecristo No.1 has the draw of a classic. This makes this Lonsdale a preferred cigar of devotees of reliable Havanas. The familiar Montecristo flavors progress in a subdued and linear, yet still pleasant, fashion. 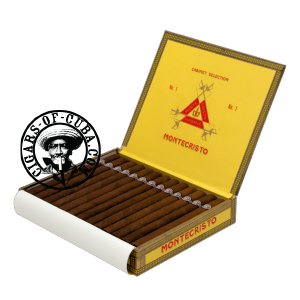 Once very popular, the Montecristo No.1 has lost it's golden touch recently, but it is a cigar that would be enjoyed by anyone starting off on their Cuban experience. One of the most famous Cuban cigars. You may like it or not, but you have to try it. A cigar with a core of earthiness, it has some light coffee bean flavors and a solid dry woody finish. A medium bodied cigar. Everything converges for the finale. Flavor, power, smoke and intensity.